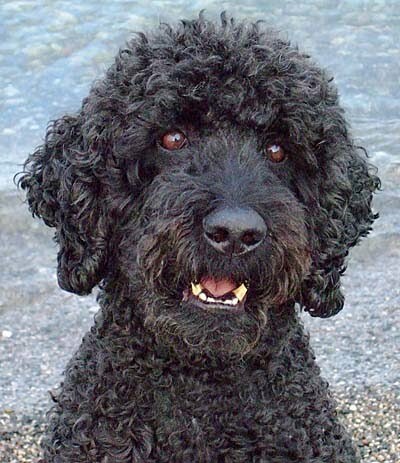 For my eighth birthday, my parents got me a black standard poodle. Because he looked like a little teddy bear we, of course, named him Teddy. Teddy was very sneaky, always doing bad things quietly and quickly without us looking which, in turn, we would later discover. One afternoon my mom made a delicious homemade, from scratch, chocolate cake with cream cheese icing to take to a friends birthday party that night. 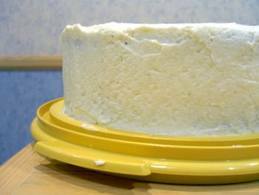 After the cake was cooled and she frosted it, Mom left it on the kitchen counter while she went to get dressed. My sister and I were in our rooms when I heard noises coming from the kitchen. I went in there to investigate. Teddy was on top of the counter hovering over the cake! He had licked all the icing off one side and had proceeded to devour that side of the cake! When he saw me, he jumped down and ran out the kitchen and hid somewhere...his usual modus operandi and I called Mom. She was so upset and there wasn't any time left to bake a new cake. Sooooo, she made more icing, filled in the "uneven" part, re-iced the cake and took it to the party!!! LOL, I wonder if anybody there ever knew what had happened and that my dog had eaten part of the cake and they had eaten after the dog! I break into fits of laughter everytime I think about that! My baddd! Anyway, you can avoid that from happening to you too by making this simple recipe!!! It's a cake in a mug! Yeah, I could call it a cupcake but then that would be misleading. But, oh no! I would never do that! Unlike my mother that day! LOL~ Seriously, you can make a homemade cake, from scratch in a simple coffee mug in just 5 minutes and it is wonderful! It's great if you're single or just want a little something without baking a whole cake or a batch of brownies. I've modified the recipe a bit to make it sweeter and moister, more like a brownie than a cake. Use a mug like one you would get from the company you work for rather than one that comes with your dishes. The "commerical" ones are a little bit taller than the ones from your set, therefore, the batter doesn't overflow. Add dry ingredients to the mug and mix with a fork. Add egg and oil. Mix thoroughly while ensuring that you get the dry ingredients off the bottom and sides. Add in the vanilla and syrup, stir. Slowly add in the milk, stir well to thoroughly incorporate it into the batter. While mixing, feel the bottom with the fork for thickness and stir until that is well mixed. Put your mug on a microwave safe plate and place it in the microwave. Cook for three minutes. The cake will rise up and over the top of the mug, but don’t be alarmed! Allow it to cool then eat it directly out of the mug or tip out onto the plate if desired. Frosting is optional.